Friday the 13th is just a stupid christian thing that is actually part of an attack of the church or something like that. I read about it but I don't remember. woooo Iowa. Sissy is from Iowa too, well now. She is from Chicago or something. I can't imagine Emmett with anybody else so I'll say he would die No one fits like Rose. So What is your favorite Book for Emmettness?ah..I might not have been here for umm maybe like 7 or 8 months..But ah..You know I thought I might pop in becuase I just saw a question I thought I might like to answer..
Oh and concerning the Ruler of Doom - Shannon is dangerous with it..I've been whacked a couple of times..And it hurts. Well I think in BD he gets the most airtime and we get to see more of his personality than in teh other books. I think in BD his character really gets to be developed more. For those of you who DO remember 'ol Ted, here's a brief update on my life that doubles as my excuse list for not being on here for so long! For everybody that has joined after my prolonged absence, I'm Mrs.TeddyBear or MTB/Ted (preferrably the latter) for short, I would love to meet you all and get to know you (though I don't know how long it will be until I make my next appearance again, sorry!) and feel free to PM me if you ever have any questions or want to talk or need help or ANYTHING I hope you've all had an INCREDIBLE time at the EDC so far, as Im sure you have since all the people here are so INCREDIBLE! But BEWARE THE RULER OF DOOM!!! Stay on topic and give good, detailed, and insightful answers to all of the questions you possibly can. Thats why we're all here, right? 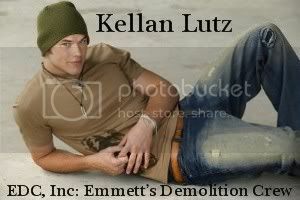 To rant and rave about Emmett and all of his beautiful attributes and perks *reminesces about the numerous house demolitions with Emm* aaahhh, anyway, perhaps I better start setting a good example and answer some questions! 'Cause it is...*drumroll*...*applaus*...*anxious silence*...*nervous laughter*...*silence*...*CLEARS THROAT*....QUESTION TIIIIIIIIIIME!!!!!!!!!! It's hard to see him with anyone else, but since that's what the question calls for I'm going to have to say Lauren. She has a lot of the same traits that Rose had as a human, the vanity and ability to be cruel and make people follow her. I think she's the human most similar to Rosalie, but that doesn't necesarily mean that it would work out (it wouldn't) I just think that's probably who would have caught his eye first if he was looking for a (single) parallel to Rose. Is Midnight Sun a fair answer? I know its not published but if you'll accept that answer, I will explain but be warned ahead lay MS SPOILERS!!!!!! !Do not read if you have not read Dark high noon and don't want it spoiled! Okay, now Im going to go ahead and spoil with my explanation: Edward's reading Emm's thoughts throughout the book, which we don't get much of in the rest of the series. I mean of course Edward is reading his thoughts other times, but SM doesn't tell us what he's thinking directly anywhere but in Midnight Sun. And I absolutely adore the part where he helps Edward with the Angela/Ben thing He has a lot of great moments in MS!! Okay, SPOILER OVER!! My second pick would be Breaking Dawn, because he has some great moments in there too! But outside of the books, if anybody has read Steph's deleted scene thing "Emmet and the Bear" (no worries Im not putting out any spoilers this time) that's also full of Emmett and very enjoyable! Gah, I still can't post because of that darned 10smiley rule!! I'm way too lazy to read what you just wrote. It's like wicked long. Okay sorry I just had to get that off my chest. lolz. Shai: Thats awesome! Isreal is so cool. Ever since I did a report on them I have always wanted to go there. And ~ALERT~ALERT~ *RED LIGHTS GO ON* COMPUTERS ARE TAKING OVER THE WORLD! EMMETT COME SAVE US!!!!!! Okay now for the q.
shai~ yeah when i get going i tend to ramble...a lot...but that's nothing compared to Bri's monster posts! Now those are looong! I'm afraid I'm saying this only because its my fave movie, but Stick IT. I dunno if he would love the drama, but he would like the girls and the humor! And I like the fact that Kellan Lutz is in it but thats just me...he'd also be into the bmx-ish stuff they do at the beginning of the movie IMO. Even though being a vamp he could do 200x better...its hard to find a movie to keep a vampire satisfied, everything out there would seem so predictable and weak to them. I guess comedy is one of the few things that they could still appreciate. thunderstorms so gotta unplug the comp ramble more later, i promise! Ted~ I didn't know you were originally from Finland. The lex is dead lately. Haha, Madagascar. Though I could totally see him loving it. I think he'd like comedy, though... I wonder if Dinner for Schmucks is any good? I really want to see it. Ted~ Yeah, Bri is very talkative. but you never saw MYYYYYY posts. I can just type foreverrrr. I have like monster posts on the teen thread. Uhmmmmmm I don't know. I agree with Hanny that it has to be a comedy but I think horror would be good too. Hannah~ yep! Finland born, Ohio bred, and now Finland bred again I've noticed the lex is not very lively...at all. But hopefully that changes soon! Shai~ Haha well at least Bri and I aren't the only talkative ones! Anywho, a question...okay, this may be a repeat but What country/region would be Emmett's favorite to vacation to? Warm or cold tempereatures? Beaches, mountains, islands etc. ? Explain why you picked the country. I am gonna post like I THINK I am supposed to so if I get this wrong, let me know and I will do it the right way! I thought he was awesome. He seems like the type of guy that I would get a long with if I had him around in my real life. I LOVE when he is teasing Bella after she changes about her love life with Edward and how mad he makes her when he says this around Charlie. If this has been discussed before, I apologize. But why do you think that he is so ready for Bella to become a Vamp? I think I need an Emmett in my real life. He just seems way too cool!